It’s been barely a year since Kozaburo Akasaka won the 2018 LVMH Special Prize for his hand-stitched, culture-blending menswear. A single Kozaburo collection might include references as disparate as the kimonos of his native Japan; changshans from China; Bruce Lee’s on-screen style; Buddhist symbols; and Western shirts and jeans inspired by a Texas road trip. Those things have more in common than you might expect; denim, for example, is central to both American and Japanese style. Many of Akasaka’s jeans come with sashiko stitching, a traditional Japanese reinforcement technique, or he’ll team a denim work jacket with an oni-inspired belt. Akasaka does all of this through the lens of Mottainai, a Japanese term that relates to a feeling of regret over wastefulness. Sustainability and upcycling are at the center of this boundary-pushing, conceptual label. While the common assumption is that sustainable practices can take something away from an aesthetic, the opposite is true for Akasaka. Look no further than his intricately-woven sakiori jeans for proof of that. His other best-selling jeans—shin-length, sculptural “3-D” flares—have become a particular signature for Akasaka. He was wearing a dark-rinse pair with heavy boots when I met him in his Bed-Stuy studio; he made a convincing case for guys to abandon their skinnies once and for all. 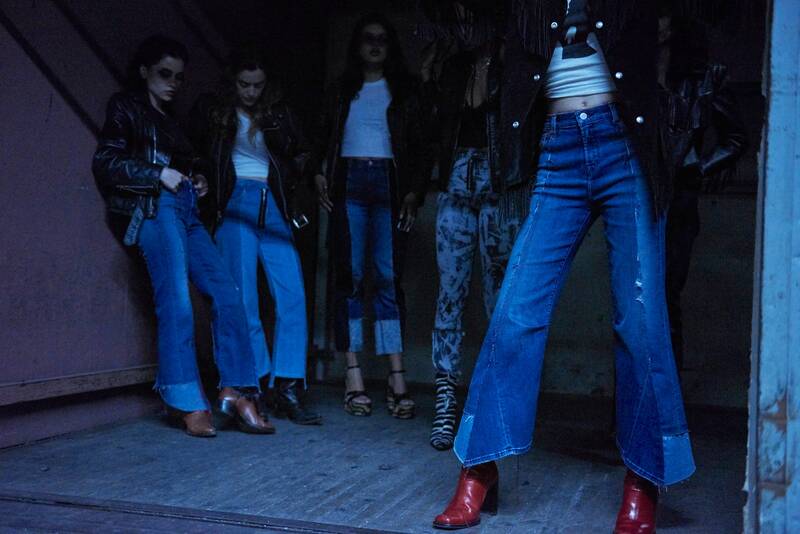 Women are obsessed with flares at the moment, too, and his latest project is particularly good news for them: Akasaka has collaborated with J Brand on a special capsule of jeans—his first-ever for women—launching today. Each pair is made from deadstock denim and scraps from the Los Angeles brand’s vast archives, some of them dating back to the early 2000s. There’s a version of his curvy flares in multiple shades of denim; paneled jeans with exposed zippers; and graphic, streaky gray jeans dyed with a special pigment in lieu of bleach. For those, he explained that he’d wanted to “show the feeling of the collection in a stroke of Japanese calligraphy,” but wanted to find an alternative to bleach, which is harmful to the environment. His decision to eliminate bleach dovetails with J Brand’s own commitment to more sustainable practices. For Spring 2019, which is in stores now, J Brand developed a “bleached” denim treatment using baby powder, of all things, and by 2020, the company hopes to be fully sustainable. That mostly comes down to reducing its water and chemical usage, but championing artisanal processes like Akasaka’s is an important (and more tangible) step. We have a feeling those will be the first to sell out. Starting today, you can pick up your pair on J Brand’s website, as well as at Barneys, Selfridge’s, and Lane Crawford; prices start at $428.